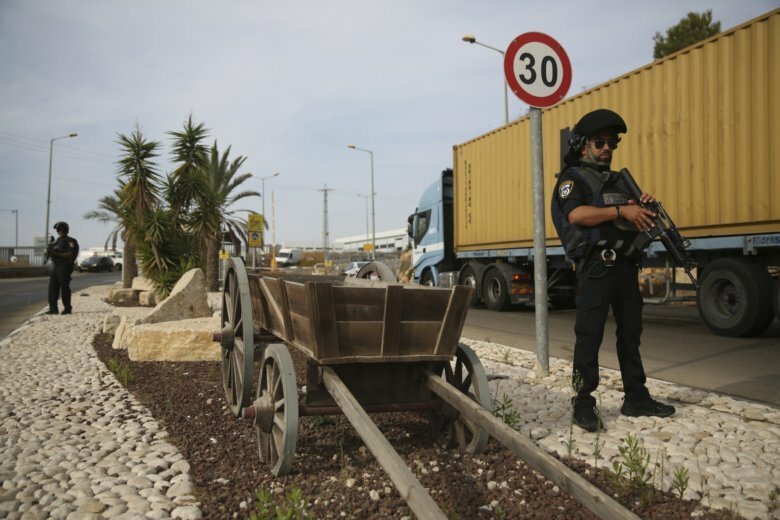 JERUSALEM (AP) — A Palestinian attacker on Sunday opened fire inside a West Bank industrial zone where Israelis and Palestinians work together, killing two Israelis and seriously wounding a third. The Israeli military said it was treating the killings as a nationalistic attack and that forces were searching for the suspect late Sunday evening. But other workers suggested the attack had been carried out by a disgruntled employee and was not politically motivated. The shooting took place early Sunday in the Barkan industrial zone, near the large Israeli settlement of Ariel. Thousands of Israelis and Palestinians work side by side at the industrial zone, which includes 160 factories. The Palestinian economy is heavily restricted under Israeli military rule, forcing tens of thousands of Palestinians to seek work in Israel as well as Jewish settlements. Military spokesman Lt. Col. Jonathan Conricus said the preliminary finding was that a 23-year-old man from a nearby village had carried out the attack. Conricus said the suspect was not known to authorities and was not believed to belong to a Palestinian militant group, saying it appeared to be a “lone wolf” attack. “We know he is still armed and considered dangerous,” he added. The Israeli military later named the suspect as Ashraf Na’alwa, a resident of a West Bank village near Tulkarm. Israeli security forces searched Na’alwa’s village near the West Bank city of Tulkarem and arrested several Palestinians suspected of assisting the suspect. Both Prime Minister Benjamin Netanyahu and Defense Minister Avigdor Lieberman denounced the attack and said the perpetrator would be brought to justice. Since 2015, Palestinians have killed over 50 Israelis, two visiting Americans and a British tourist in stabbings, shootings and car-ramming attacks. Israeli forces killed over 260 Palestinians in that period, of which Israel says most were attackers. Gaza’s Hamas rulers and other militant groups praised Sunday’s attack, but none claimed responsibility for it. One of the victims was identified as Kim Yehezkel, a 28-year-old mother of an infant son, who worked in the office that was attacked. The second was named as Ziv Hajbi, 35. Another woman in her 50s was seriously wounded. Closed-circuit footage from the scene showed a man holding a handgun and wearing a backpack, fleeing down a flight of stairs and then dashing past stunned onlookers. Conricus said the attacker was employed in one of the factories and had a valid working permit. While insisting the attack was an act of terrorism, he acknowledged there were “other factors involved as well,” without elaborating. Moshe Lev-Ran, an export manager at a company whose factory is located next to the scene of the attack, said he doubted the official account. “No way in our industrial zone,” he said, describing an atmosphere of camaraderie in Barkan.